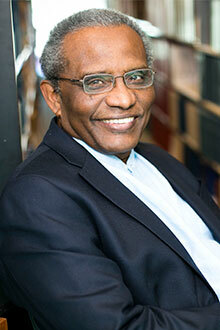 Abdullahi Ahmed An-Na'im, originally from Sudan, is an internationally recognized scholar of Islam and human rights, and human rights in cross-cultural perspectives. He is the Charles Howard Candler Professor of Law at Emory Law School, a senior fellow of Emory’s Center for the Study of Law and Religion, and director of Emory Law’s Center for International and Comparative Law. An-Na'im is the author of several books, including most recently “What is an American Muslim? Embracing Faith and Citizenship” (2014, Oxford University Press), in which he applies the thesis of his 2008 book, "Islam and the Secular State: Negotiating the Future of Sharia" (Harvard University Press).